"These cute charm earrings are made of .925 sterling silver with a hypoallergenic steel earring post and back (or nut). Many of these cute earrings have matching pendants. You can order just the earrings, just the pendant or the set with and without a chain. The pictures for these earrings and charm sets are larger than actual size to show detail. The charms and earrings generally measure about 3/8" to 1/2" including the ring on the charm. These are small earring and pendant sets. The pendants include a 5mm split ring for extra safety. If you choose to include the chain they are a .925 solid sterling silver curb chain. This chain is thicker and sturdier than the typical pendant chains that you find in stores." What we thought: This set is absolutely gorgeous! It is so dainty and whimsical:) Each time I've worn this set I've gotten compliments on it. The pieces are really well-made. Charm Country has an extensive line of charms and charm bracelets, but they also have personalized jewelry and birthstone jewelry. You can build your own charm bracelet or pick one of their themed bracelets. If you're feeling super creative, you can order the supplies to make your own jewelry! Charm Country is a great one-stop shop for charms, bracelets and other silver jewelry. Not to mention, the prices are super affordable. If you're shopping for back-to-school accessories, check out Charm Country! ABCD Diaries gives Charm Country an A+! Buy It: You can find this gorgeous set and others, along with charms, bracelets, jewelry making supplies and beautiful gift items at Charm Country! Win It: Charm Country has generously offered one ABCD Diaries reader an earring and necklace set of their choice! To enter, follow our blog via GFC and comment below. Disclosure: ABCD Diaries was given a earring and necklace set for review purposes only. We were in no other way compensated. The opinions expressed in this post are ours and ours alone. Love this necklace set. It's so pretty. "Like" ABCD Diaries via Facebook. Follow ABCD Diaries via Twitter, ginny71. 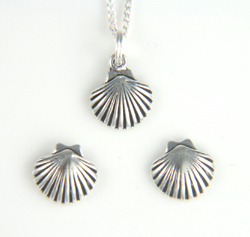 We really like the silver necklace, its a great design for fans of the beach.